When you use Eclipse by default most generic type problems show up as warnings. Unfortunately this results in lots of warnings when you use ATG code. 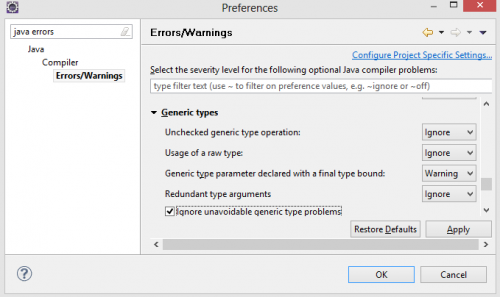 You can turn off the warnings that result from ATG code by checking the option “Ignore unavoidable generic type problems”. By default Eclipse reports warnings for the above line. But this is unavoidable and with this Ignore option turned on no warning is reported for this line. Kind of useful and you don’t have to add @SuppressWarnings(“unchecked”) liberally through your ATG code. When I imported a new project I could not build it because of “Resource already exists on disk” errors like this. The simple fix was to remove the directory, typically classes, which contained the file it was complaining about and then refreshing. Removing just the file and then refreshing did not work. However when I would do an ant build later and then refresh my project I would get the same error. The better solution is to tell Eclipse not to copy the files it is complaining about to the output folder. Select Java Compiler -> Building. In the Filtered resources box add the files you don’t want copied. Here is a screenshot showing how I added “*.properties, *.xslt” to the Filtered resources to fix this problem. IBM Rational Application Developer (RAD) is basically a typically IBM heavy version of Eclipse. WebSphere is a typically IBM heavy version of a J2EE server. Therefore you would think you could debug web applications using RAD fairly easily like you can on JBoss or ATG DAS using Eclipse. However I could not find anyone on my latest project who knew how to do this. Fortunately after much Googling I found this PDF document, Debugging Applications in IBM Rational Application Developer, and on page 12 are instructions on how to do this. The instructions seem to be a little out of date so here are my instructions. Log into your Integrated Solutions Console. The default URL is http://localhost:9060/ibm/console/login.do. Navigate using the left side column to Servers –> Application Servers. 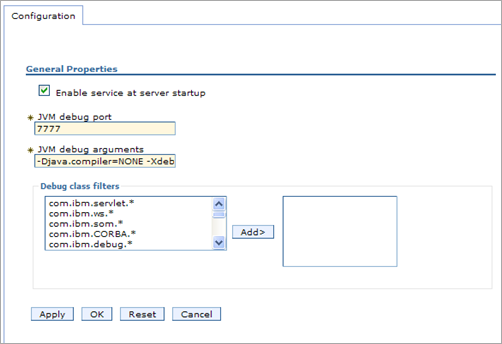 Select the Application server you want to debug from the list of Application servers. Under the Configuration tab select the Debugging Service link which is near the bottom right in the Additional Properties section. Select the “Enable service at server startup” checkbox. Note the JVM debug port. In the Messages box, which appeared at the top after pressing the Apply button, click on the Save link. Stop and start your Application Server. It should now be running in Debug mode. In RAD go to the project for the web application you want to debug. From the menu select Run –> Debug Configurations. 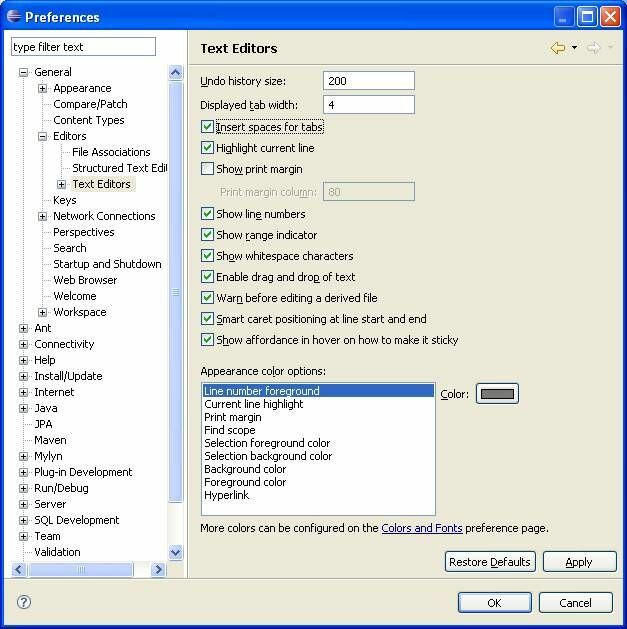 Select Remote Java Application and press the New button (it’s the top left button). For the port set it to the JVM debug port (default is 7777). Press Apply. Then press Debug. It should connect to WebSphere’s JVM. Eclipse user libraries are wonderfully convenient ways of packaging together related JAR files. 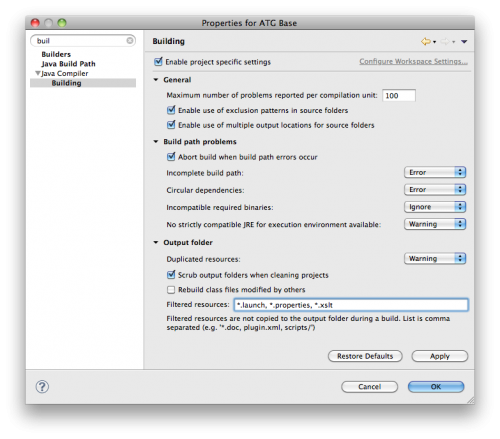 In my Eclipse I create user libraries for each ATG version I install. As a consultant I am always installing different versions and today I installed ATG 9.0. Normally I use the GUI to create the user library for the latest ATG server. However I thought this is quite inefficient because I already have user libraries for previous versions of the ATG server. I just need to duplicate one of the other ATG user libraries and then tweak the duplicate to have the right path to the JAR files. Unfortunately the Eclipse GUI does not provide a way to duplicate a library. So I searched in my workspace files and found in my .metadata/.plugins/org.eclipse.core.runtime/.settings/org.eclipse.jdt.core.prefs file the settings for all my user libraries. I then edited that file and copied an entry for an older ATG library, org.eclipse.jdt.core.userLibrary.ATG\ 2007.1. I renamed it org.eclipse.jdt.core.userLibrary.ATG\ 9.0 and updated the paths to where ATG 9.0 is installed and I was done! The holy war about spaces or tabs continues and you can see all sorts of arguments for each side raging around the internet. I prefer spaces because it’s a consistent format that remains the same no matter what you are using. With tabs things appear differently depending on how your editor or other program is configured. Plus the worst thing is when spaces and tabs get intermixed. Arguments for tabs such as they take up less room or it’s easier to move around are in my mind weak. In this day of terabyte disk drives, file size differences between tabs and spaces are trivial and most of your disk space is taken up by images and binary files anyway. And being able to move around and format quickly is not an issue either with modern editors. The two editors I use most are XEmacs and Eclipse. Below I describe how to use spaces for indents for each program. 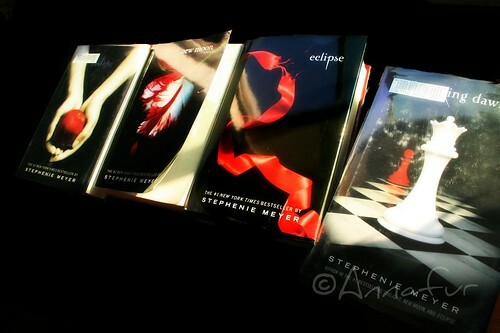 I was about to write a post about how much I was starting to dislike Eclipse. Two years ago I was singing the praises of Eclipse but Eclipse Europa (version 3.3) in my opinion has been a disaster. It is incredibly slow, crashes often, runs out of memory, etc. I found myself at times using XEmacs instead because it was faster. But today I installed Eclipse Ganymede (version 3.4) and so far life has been much better. It is much more responsive, it is not crashing, things are running smoothly. You can read about what is New and Noteworthy in Ganymede. The most exciting new feature to me is the Retain case of match when replacing, just like XEmacs. Also I noticed that in my JBoss project, hot swapping of code is again working. I am not sure if this is because I upgraded to Ganymede or because I turned on “Build Automatically”. I suspect it might be the latter. Recently I have been having problems with Eclipse running out of memory. Previously I had as my command line argument for Eclipse. The double dashes were a problem, preventing Eclipse to properly load the correct memory settings from eclipse.ini. I then removed the -vmargs –Xmx512m from the command line argument and instead modified eclipse.ini which is in the top level of the Eclipse installation. This blog article, Eclipse and memory settings, explains how you should put each argument on a separate line and that you can go to Help > About Eclipse Platform and then click on the Configuration Details button to check that Eclipse is running with the correct settings. but I reverted back when I realized it was my original command line argument that was the problem. I tried to use these settings as recommended in this forum, [news.eclipse.tools.jdt] Re: How to prevent out of memory errors? But for some reason that kept crashing the Eclipse startup.